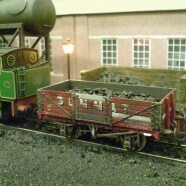 I picked this kit up at with the intention of producing a severely distressed wagon for loco coal on Summat Colliery. Nice kit to build, but you do need something like EMA Plastic Weld to stick the black ABS bits. The body was primed with red oxide primer and Halfords Ford radiant red was used as the final colour. After a couple of weeks to let the paint and transfers to harden I used a combination of the techniques described by David Spencer in Hornby Mag Issue 6 and bounce spraying the underframe to distress the wagon. I took it slowly as this little wagon had taken a lot of time – I didn’t want to mess it up in the weathering stage. Real coal over a lot of lead made it a heavy little wagon that ran well at subsequent shows. Who would have thought that I would have heaped so much attention on a WAGON?